For the Double-A New Hampshire Fisher Cats on Monday, good things came in threes. Three pitchers combined to throw the third no-hitter in franchise history, stifling the Portland Sea Dogs in a 6-0 victory. 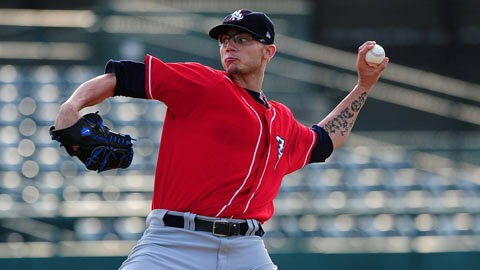 Starter Brett Cecil (2-2) threw 5 2/3 innings before being relieved by Danny Farquhar, who pitched the next 2 1/3. Ronald Uviedo finished it off in the ninth. It was the first Eastern League no-hitter this season. "It was just exciting. Nobody really talked about it in the dugout, it was hush-hush in there," said Farquhar, who struck out three and walked one during his portion of the no-no. "In the bullpen we were talking about it, guess we're less superstitious than in the dugout." It was the first no-hitter for New Hampshire since Kyle Drabek threw a complete-game, nine-inning ho-hitter against New Britain on July 4, 2010. Farquhar said the closest call came with two outs in the eighth, when Portland's Ryan Dent hit a ground ball up the middle and second baseman Brian Bocock had to range far to his right to make the play. "Bocock made an amazing play," said the reliever. "It was a soft liner up the middle, past me to my right and he went into the outfield, made the play and threw the guy out. That was a great play." Cecil, who went 4-11 with a 4.73 ERA in 20 starts last year with Toronto, remained on a pitch count as he continues to work with the Fisher Cats. Farquhar said that as the no-hitter picked up steam, the pitchers in the bullpen knew they'd be responsible for holding the bid together. After 5 2/3 innings, three walks, eight strikeouts and 86 pitches, the left-hander handed off to Farquhar. "We were actually talking about it in like the third [inning]," said Farquhar. "We knew Cecil's limit wouldn't let him finish, so we were kind of joking, 'Oh we're going to have to finish this out.' I didn't think about it too much, though. I thought about making pitches. If you think about it too much you won't attack the hitter, you'll be afraid of allowing a hit." Farquhar said as the game progressed further, the dugout took on an almost surreal sense of calm. "Nothing really felt different, nobody kept away from me, everyone chatted just like normal," he said. "Honestly it didn't even seem like a no-hitter was going on the way everyone was acting." Once it was finished though, the Fisher Cats let loose and celebrated the moment. "The pitchers and position players were excited, we jumped around a little bit, everyone high-fived, gave congratulations," Farquhar said. "In the end, it's baseball, we had fun." It wasn't the first no-hitter the right-hander has ever been involved in. Farquhar and Detroit Tigers catcher Alex Avila teammed up with another pitcher to throw a no-no for Archbishop McCarthy High School in Southwest Ranches, Fla.
On Monday, first baseman Mike McDade doubled and drove in three runs for New Hampshire while Bocock added a pair of RBIs.